Since little sister recently started walking and is very soon going back to daycare, I figured it was high time I buy her a pair of shoes. This summer she's been home most of the time and carried, so since I'm all about comfort, I just let her go bare foot everywhere. 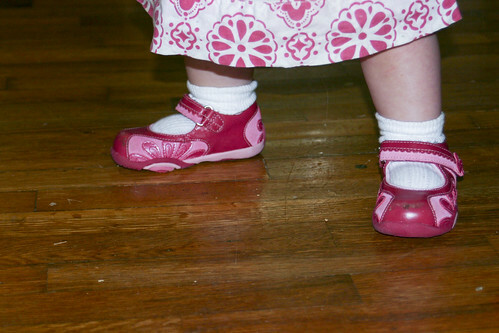 I can't remember why, but somehow I got it into my head that she wore a size 4. So when I took her to the shoe store and they measured her foot, I gasped in shock. (really, I did!) She wears a size 6!!!! For perspective, he sister wears a 7. I even made them measure again. . .twice. Little Miss P isn't exactly small. . .
those are the sweetest big feet and shoes though! !